It is disturbing to see a phone restarting itself over and over again, which is like being trapped in a desperate infinite loop. I’m newbie to rooting phone. Recently installed CM 12.1 on my Moto XT 1635. now I wanna change to some other OS. so i did the data and apps backup by using TWRP. But suddenly my phone is getting automatically restarting continuously and not able to use it. what I need to do for getting back my phone to normal? Kindly Help me guys !! But instead of being anxious, have you ever thought about why this troublesome occurrence would happen? If you haven’t, then read the reasons below carefully. Part 2: How to Restore Data from an Automatically-Rebooting Android Phone? This is one of the most common reasons for random rebooting. Pay attention that the APPs used should be dependable, especially those, with which you sent emails and messages. Unload the unnecessary apps and upgrade others regularly. Android system software can sometimes be flawed, especially when you have flashed a custom ROM with poor quality. There are two things you can do: 1.Flash a stock ROM; 2.Factory reset by following this process: “Settings > Backup & reset > Factory data reset”. Note that if your phone begins to restart itself before entering the desktop, you should boot it into Recover Mode to do resetting. Note: Factory resetting would certainly erase all of your storages in the device, so do the backup before this operation. 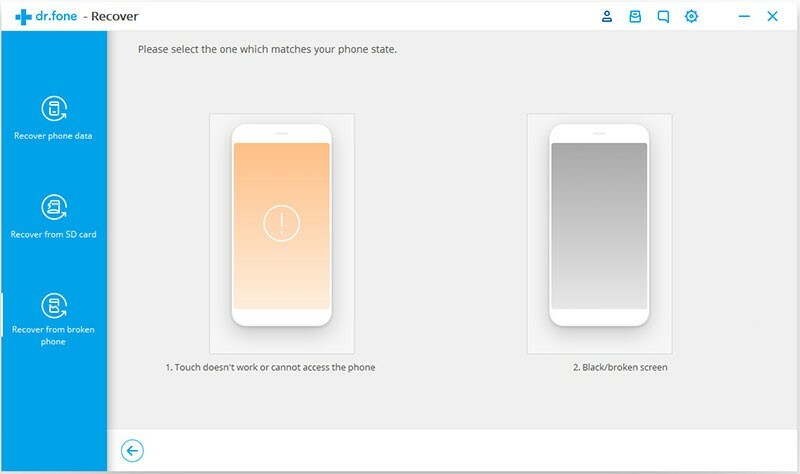 It will be most likely that you have just bought a defective Android phone with faulty hardware, if every measure taken is useless and the device still restarts on its own again and again. Try to contact the phone seller or manufacturer, however, this does not work when you have installed a custom Android ROM by yourself. Maybe you should complain to the ROM maker in this situation. Assume that you are going to sent the phone, which cannot stop rebooting itself, to a fix store, it is significant to get your data out of the phone first, for they might lose during the process or be stolen by some evil persons. Some tools must be used in recovering files from a rebooting device, one of the most recommendable choices would be Android Data Extraction(Damaged Devices). Believe it or not, it is a highly advantageous toolkit for recovering data from a Samsung Galaxy phone or table working abnormally. Next, let’s see how to use this helpful software. 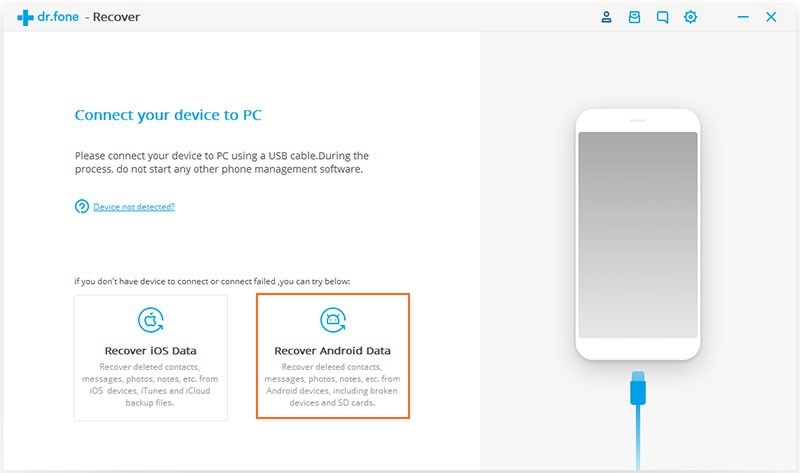 Step 1: Run the software and choose “Recover” feature from the interface first, then connect to the PC via a USB cable. 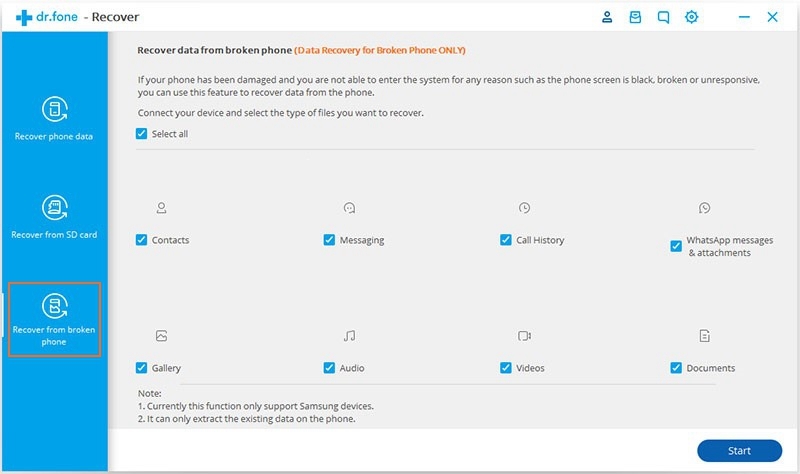 If the software doesn’t recognize your phone, manually click the “Recover Android data” to go on. Step 2: On the left window, choose the third option “Recover from broken phone”. 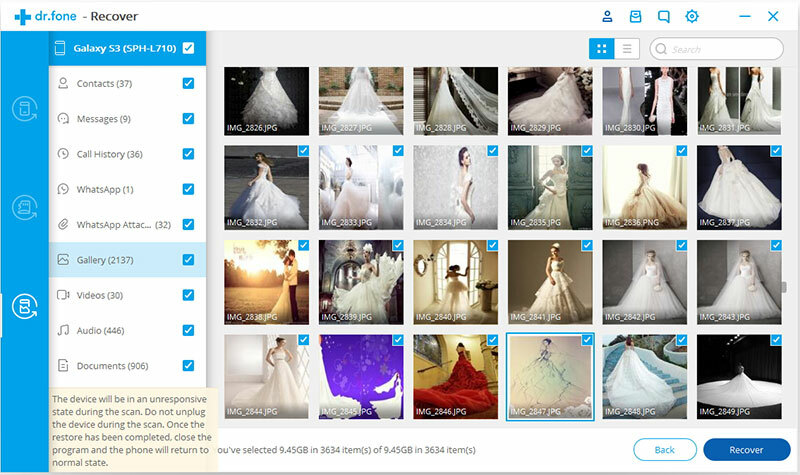 Then select the file types you want by ticking the boxes on the list or “select all”, click “Next” to keep on. Step 3: In the next window, because your Android phone restarts repeatedly, opt for “Touch cannot be used or cannot access the phone”. Then go to the next step. 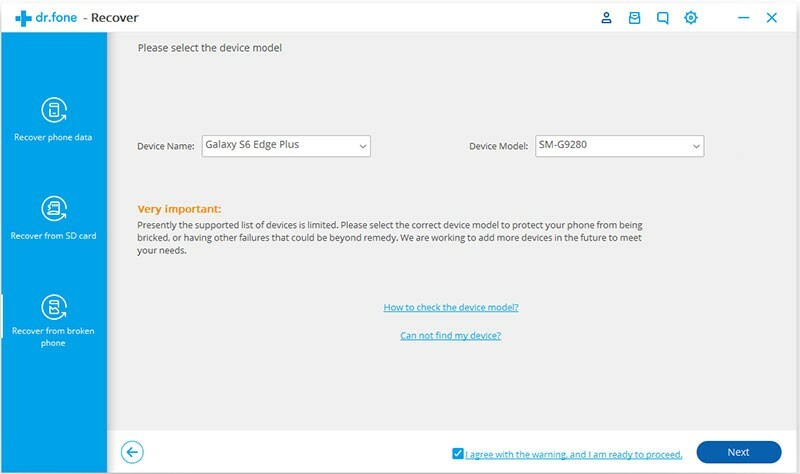 Step 4: Find your own device name and model in the drop-down list and then click the “Next” button to go on. Note that any special situation should refer to the instructions below. 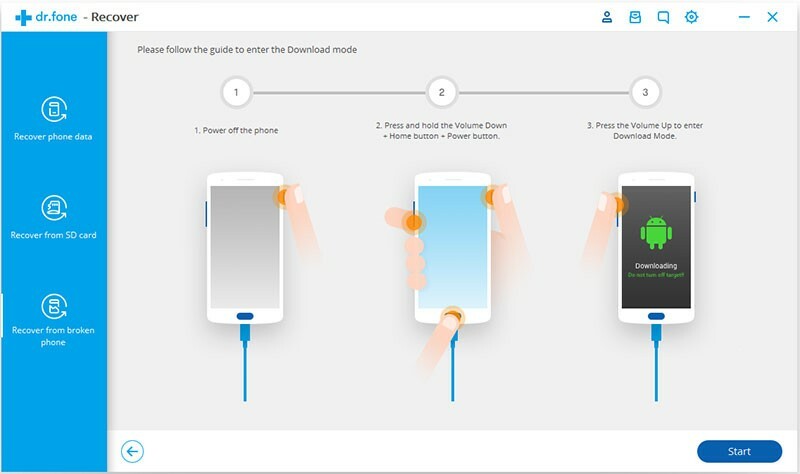 Step 5: A three-step guidance is provided to lead your device into Download Mode, which is a indispensable step in doing recovery. Step 6: In this part, Android Data Extraction is to offer your device a “body check” , then you can tick the files that you intend to restore and have a final preview of them. If everything is ok, click “Recover” to complete this procedure then all files will be saved to your computer. Presumably, Android users more or less encounter such problems as randomly-restarting device, even though, there is no need to worry or curse, for there is few flawless phone. What we can and should do is to know some basic knowledge about how to use our phones properly and how to do a routine data backup.